Greenwall is a settlement located in the Rift, north of the Skyrim city of Riften. Throughout history it has primarily served as a military outpost due to the strategic placement of Fort Greenwall. A small natural aquifer known as Greenwall Cave runs beneath the fort. A Snow Elf settlement was once built on the site of Greenwall, although its name and origins are unknown. The Snow Elves were driven nearly to extinction following Ysgamor's invasion of Skyrim, and in time the ruins became buried deep underground. Fort Greenwall was originally built to guard the road between Riften and Windhelm. During the construction of its underground passages, the elven ruins were partially excavated. The substructure beneath Fort Greenwall was described during the Second Era by archaeologist Hrerm House-builder, although he purposefully failed to mention the discovery of the elven ruins and described the architecture as entirely Nordic. Fort Greenwall was sacked by the forces of Ada'Soom Dir-Kamal during the Second Akaviri Invasion in 2E 572. 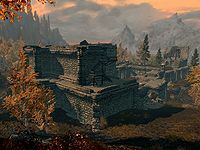 The fort was then neglected by the Ebonheart Pact, who failed to refurbish and regarrison it. By 2E 582 the fort had been taken over by bandits. They were cleared out when the thane of Riften's housecarl sent a shipment of cursed wine along the road, which the bandits duly stole and began to drink. Drunk, and unable to sate their thirst with the magic wine, the fort was then easily stormed. By the time of the Imperial Simulacrum, Greenwall had become a village, being ruled by Lady Hante. It had a rivalry with Reich Corigate. It was neighbored by several settlements, including Riften to the east, and Sunguard to the northwest. The settlement was eventually abandoned, and by 4E 201 the ruins of Fort Greenwall had once again come under bandit control. During the Stormcloak Rebellion, the fort served as a point of contention between the Imperial Legion and the Stormcloaks, with both sides struggling for control. This page was last modified on 22 March 2019, at 18:53.